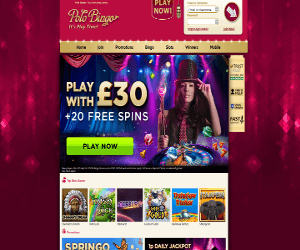 Polo Bingo Review | Claim up to £100 Welcome Bonus! New players at Polo Bingo can collect a 200% bonus for up to £100 + 20 Free Spins as soon as they make a £10 1st deposit! Players can use their bonus cash to play the best bingo games in the UK and win even more! All members can also enjoy free bingo games and show-stopping promotions. There are four free bingo rooms with real jackpots to be won all day! Plus, newly registered players get 3 days of free bingo just for signing up – no deposit required! Some of the hottest promotions include Self-Made Millionaire, with a whopping £1,000,000 jackpot up for grabs! There are also blockbuster promotions taking centre stage every month. So it’s always worthwhile to take a trip to this one-of-a-kind online bingo casino. Polo Bingo truly knows how to bring the high-life to the bingosphere! VIP Diamond Club members get pampered with even bigger bonuses, exclusive games, Free Bingo and surprise gifts, plus their very own VIP manager! In addition to their 75 and 90 ball bingo games, Polo has a stunning variety of slot, casino and scratch card games in keeping with their new casino look. Fluffy Favourites, Monkey Paradise, Fruit Slots, Irish Luck and Piggy Payout are just a few casino games worth mentioning. You can also enjoy hits like classic Roulette, Blackjack games and video Poker in the casino lounge. Polo Bingo really has got em’ all! Like sister site Moon Bingo, Polo Bingo Players get treated 24/7, just for socialising on the site. Polo Bingo Chips are doled out daily, and are redeemable for real bingo cash. Players get chips just for visiting the site, playing bingo games and following Polo Bingo on social networks like Facebook and Twitter. Lord Bingo loves Polo Bingo’s new interactive blog, super-friendly chat community, VIP perks and rewarding bonuses, in addition to their focus on bingo slots. It really is a luxury casino, the most glamorous bingo and slot hot spot for UK bingo players who love the high-life! Polo Bingo Mobile is one of Lord Bingo’s favourite mobile bingo sites. The site is fully compatible on all Apple and Android devices, both phones and tablets. 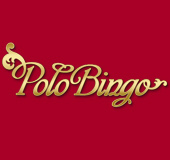 iPhone players can download the Polo Bingo App directly to their phone. When players join Polo they’ll be entitled to a 200% Welcome Bonus up to £100 + 20 Free Spins! Players can enjoy a fabulous games selection on the go. Some of the most popular games on Polo’s main site are available on the app including a fantastic variety of 75-ball and 90-ball bingo games. Other top side games on Polo Mobile are Fluffy Favourites and Shaman’s Dream. You’ll even be able to fully utilize the chat rooms straight from your phone or tablet.